With over 130 caps in 13 years of action, Jeff Agoos was a rock solid fixture in the US National Team defense. A four-time All-American at college powerhouse Virginia and a member of the U.S. under-15, U-17, U-20, Olympic, World University, and Futsal teams, “Goose” has played at every level of American soccer. He was elected to the National Soccer Hall of Fame in 2009. Agoos won his first cap on January 10, 1988 against Guatemala, scoring his first goal three days later also against Guatemala. His last cap came against Wales on May 26, 2003. During his run, Agoos made 130 appearances, second to Cobi Jones on the all-time US list. Barely missing out on the 1994 World Cup squad, Agoos made the ’98 and 2002 squads. For someone with so much National Team experience, his World Cup debut came late, the opening game against Portugal in 2002 and he would see time in the rest of the group stage games. On the club side, Agoos spent time with the USISL Maryland Bays and the indoor Dallas Tornado of the MSL. Agoos spent a season with Germany’s SV Whehan, then a fourth division club. Joining DC United in 1996, Agoos would eventually win five MLS Cup winning sides (D.C. United in ’96, ’97, and ’99, and the San Jose Earthquakes in ’01 and ’03) setting a record that even for a young league should stand for some time. Considered a consummate professional and a true leader who understood what it took to win championships, Agoos retired at the end of the 2005 season as a member of the Metrostars. He did color commentary for XM Radio’s coverage of the 2006 World Cup, and wrote a monthly column for USSoccerPlayers throughout 2006. Agoos describes his style of play as “intuitive and intelligent,” and believes that his ability to “read the game” is his best skill. In September of 2006, Agoos was hired by his former coach Bruce Arena as the Technical Director of the New York Red Bulls for the 2007 season. That post was scrapped when Arena was fired at the end of the 2007 season, and Agoos became interim sporting director. Dropping that interim title, he became Sporting Director at Red Bull NY before moving into a role at MLS headquarters. 2002: Started all three first round games for the U.S. in the 2002 World Cup and scored an own goal in U.S. 3-2 win over Portugal. Moved into second place all-time past Marcelo Balboa in all-time appearances for the USMNT. Assisted on Tony Sanneh’s goal vs. Uruguay on May 12. Named to Gold Cup Best XI. Scored brilliant free kick goal to seal the 2002 Gold Cup title vs. Costa Rica. 2001: Finished third in the annual Honda Player of the Year voting for best U.S. national team player after performing various defensive roles for the side in World Cup qualifying. 2000: Played in every minute of the 2000 Sydney Olympics as one of the over-age players and helped the team to a fourth place finish. 1999: Won a bronze medal at the Confederation’s Cup in Mexico. 1998: Was a member of the team that competed at the 1998 World Cup in France. 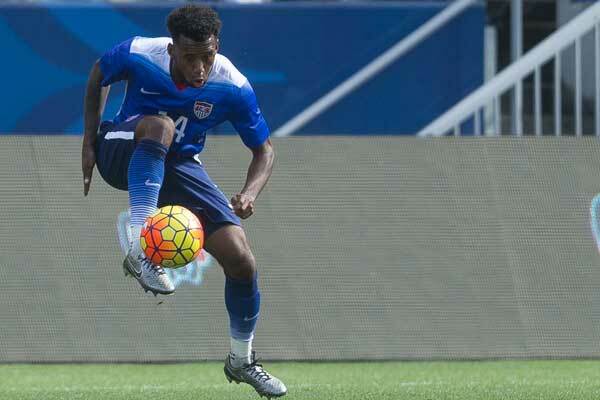 Helped lead the side to the final of the CONCACAF Gold Cup. 1997: Played more than any other player in the successful World Cup qualifying campaign. 1993: Established himself as a national team regular, starting 16 matches and playing in another four. 1992: Won a silver medal with the U.S. national futsal team in Hong Kong. 1988: Made his international debut on January 13, starting against Guatemala, and scored his first international goal just three days later, also against Guatemala. 2005: Finished his Major League Soccer career as a member of the MetroStars. 2004: Played 90 minutes in every game he appeared in except two. Scored his only goal of the season on 6/12 versus the MetroStars. Named to the West Team for the 2004 MLS All-Star game. 2003: Started all 28 games of the regular season, logging nearly 2600 minutes. Scored two goals, including a trademark free kick, and had two assists. 2002: Started nine of 12 games after missing a portion of the season on national team duty; went over the 14,000 minute mark in minutes played. 2001: Captained the San Jose Earthquakes to their first MLS Cup victory after being traded from D.C. United in the off-season. Named MLS Defender of the Year. 1999: Led D.C. United to their third MLS title. Named to MLS Best-XI. 1998: Named as a finalist for MLS Defender of the Year. Won the Interamerican Cup Championship with United. Helped D.C. to reach their third consecutive MLS Cup final, but lost out to the Chicago Fire. 1997: Was an integral part of D.C. United championship run. Named to MLS Best-XI. Named as a finalist for MLS Defender of the Year. 1996: Won the U.S. Open Cup with D.C. Won the inaugural MLS Cup with D.C. United and former college coach Bruce Arena. 1995: Played for German Third Division side SV Wehen. 1992: Played indoor soccer with the Dallas Sidekicks of the MISL. 1991: Made his professional debut with the Maryland Bays of the A-League. Youth and college: Soccer was just one of many sports in Agoos’ life when he was young. He also enjoyed basketball, baseball, football, and swimming. His athletic ability was already being recognized at just 11 years of age, when he was selected to be part of the Flame Soccer Club, a traveling team based out of Dallas. Agoos first represented his country as part of the under-15 national team and became a standout high school player for JJ Pearce High School, which he led to a Texas State Championship in 1983. After his high school success, Agoos wasted no time making a name for himself at the University of Virginia, where he became the only player in the history of the university to be named an All-American in each of his four years.